Everything is less than $100! 1. A sophisticated side chair that'll make an excellent addition to your reading nook. Get it from Birch Lane for $87.99 (available in seven colors). 2. Peel-and-stick wallpaper for giving your room a refresh without the mess and commitment that comes with painting the walls. Each roll measures 20.5 inches wide by 16.5 feet long and covers about 28 square feet. There's no need for water or adhesives — just peel and stick! You can also use it to line drawers or decorate furniture. Get it from The Home Depot for $34.97. 3. A summery braided jute rug so you can put your furry one into storage until next winter. The rug in the picture is the 5' diameter size. Get it from Amazon for $65+ (available in four sizes). 4. Stylish throw pillow covers to give your old couch a brand new look. You can purchase throw pillow fillings separately. These throw pillow cases measures 18"x18" but some reviewers reccomend sizing up to 20"x20" fillings for a fuller look. Get a set of four from Amazon for $39.95. 5. An upholstered panel headboard that'll make your $50 bed frame look like a $500 one. Get it from Wayfair for $62.99+ (available in sizes twin–king and five colors). 6. A ladder bookshelf for an attractive way to display your fave novels and knick knacks. Get it from Amazon for $66.99. 7. Nesting coffee tables you can use together or separately as end tables. 8. 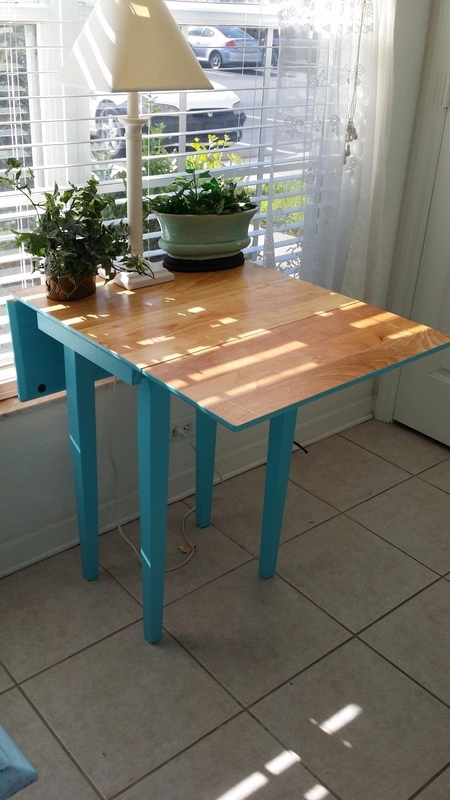 A retro two-tier desk to replace the wobbly one your old roommate left behind. Get it from Amazon for $53.51+ (available in four finishes). 9. A glass coffee table that'll make the living room seem bigger and let you show off the pretty rug. Get it from Walmart for $89.90 (available in two finishes). 10. A floral duvet set for an easy way to spruce up a plain comforter. It'll brighten up your entire bedroom! This set is made of microfiber and comes with one duvet cover and two pillow shams. Get it from Amazon for $33.99+ (available in sizes twin–king and three patterns). 11. A modern, color-block canvas art print people will think you sourced from an expensive boutique. 12. Peel-and-stick marble contact paper to give your kitchen countertops a dramatic transformation. Each roll measures 2'x6.56' and covers approximately 13.12 square feet. Get it from Amazon for $25.95+ (available in two sizes and 17 patterns). 13. A versatile mid-century chair that would make an excellent addition to both your dining room and home office. 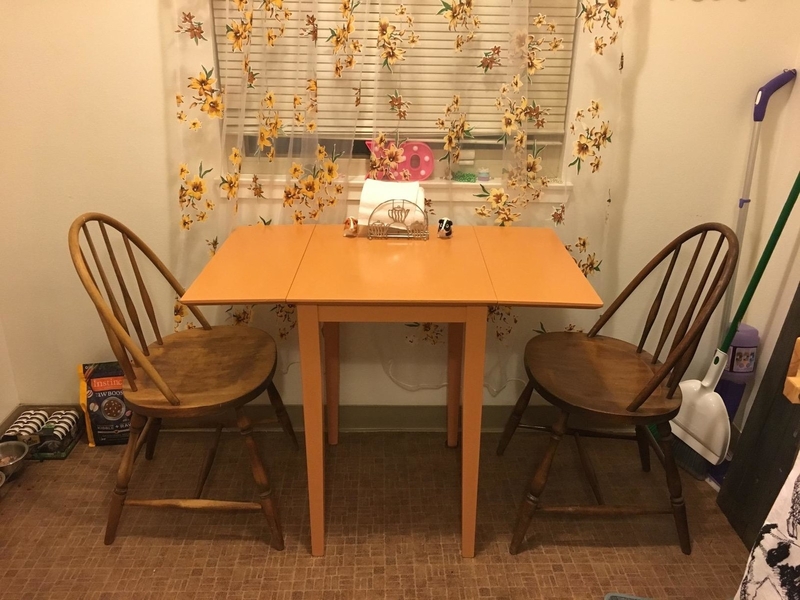 I bought this chair for my apartment and use it as both a computer desk chair as well as a dining chair. It's super comfortable and easy to clean — crumbs and spills just wipe right off. Get it from Amazon for $61.05 (available in nine colors). 14. A drop-leaf wood table you can leave untreated for a natural look or paint to match your interior. Get it from Amazon for $77.60. 15. A windowpane patterned pouf for adding a splash of color (and an extra seat) to your neutral living room. Get it from Target for $45.49. 16. An elegant fabric accent chair sure to attract a ton of compliments. Get it from Amazon for $77.11+ (available in two colors). 17. Curtain string lights to create a warm and cozy ambiance with very little effort and $$$. 18. A faux fur rug so you can turn a cheap plastic chair into a cozy throne. 19. A brass reading lamp that's the perfect combination of form and function. 20. A cotton shower curtain for achieving a clean and bright bathroom aesthetic. This shower curtain is made of 100% cotton. 21. A rustic storage buffet as the most stylish way to display extra dishware that won't fit inside the cabinets. Get it from Walmart for $57.92. 22. A tri-fold mirror so you can turn any ol' desk into a full-sized vanity. 23. A versatile cube storage organizer that can be whatever you want it to be — a bookshelf, wine cabinet, chest of drawers, etc. Get it from Walmart for $64.88 (available in six colors). 24. Wall-mount corner shelves for decorating that awkward empty area that's too small for a piece of furniture. Get it from Amazon for $19.99+ (available in five finishes). 25. An industrial glass pendant light so you can give your kitchen a Fixer Upper–style makeover. Edison bulbs can be purchased separately. Get it from Amazon for $38.99+ (available in three finishes). 26. A gilded round mirror to liven up the plain wall in your entryway. It'll impress your guests and you can check your teeth for spinach before leaving the house! This mirror measures 20" in diameter. 27. A magazine rack and side table that'll save space and look chic. 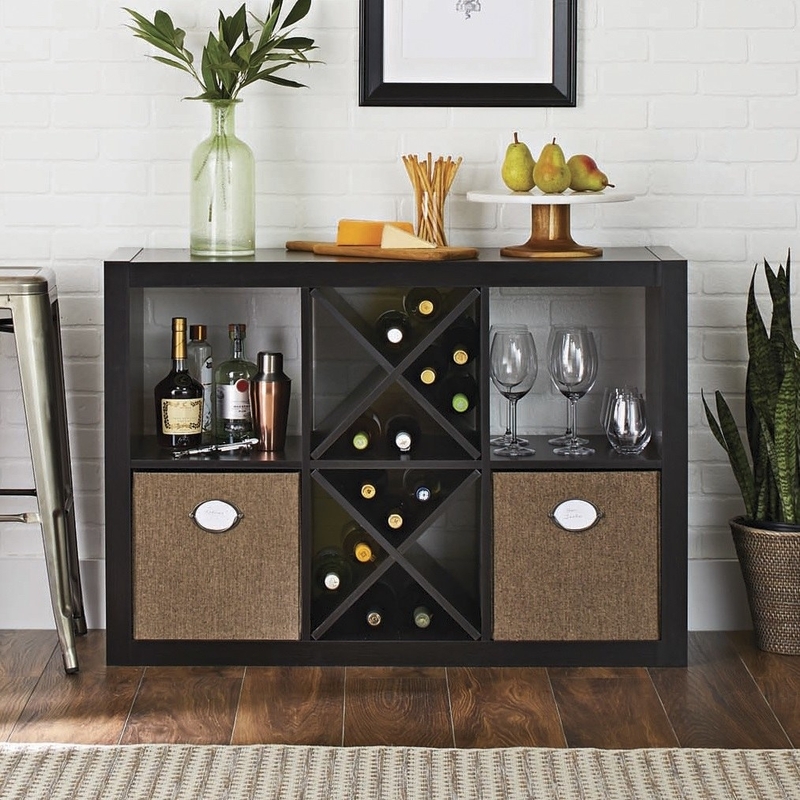 Get it from Wayfair for $66.99 (available in two colors). 28. A gold bar cart for anyone who doesn't have space for a home bar. Plus, you can roll it from room to room as needed! 29. A picture frame set so you can create a gallery of favorite photos and art pieces. Get a seven-piece set from Wayfair for $40.84. 30. A coat rack and storage shelf to bring order to a normally chaotic entryway. Get it from Amazon for $81.99. 31. A colorful end table that'll not only look amazing but will also provide tons of storage space. Get it from Target for $85.49 (available in two colors). 32. A floral tapestry for a quick and cost-efficient way to decorate a large blank wall. No need for frames or nails — you could just use push pins. 33. A multi-tiered hinged stand so you can give your smaller plant babies a chance to shine. Get it from Wayfair for $77.43. 34. A tufted storage ottoman that can hide away clutter, provide extra seating, and double as a coffee table. Get it from Walmart for $79.99 (available in four colors).